Cunningham Bond are luxury property experts based in the Balearic Islands. They required a rebrand, including naming and a visual identity. After a deep immersion in the company it was clear they offer much more than just property advice. They are instead guides to an elite lifestyle on the islands. The brand strategy focused on offering their clients access to their ‘little black book’ of island contacts. This influenced the entire visual brand approach. The logo was inspired by the distinctive Spanish tile designs found in many of the luxury villas. The three logo ‘tiles’ are abstract versions of the three Balearic island’s flags where Cunningham Bond operate; Ibiza, Mallorca and Menorca. The digital experience creates a premium feel with the monochrome colour scheme with hints of gold detailing. The colour and vibrant element to the brand comes from the island activities, properties and events shown in the various sections of the site. 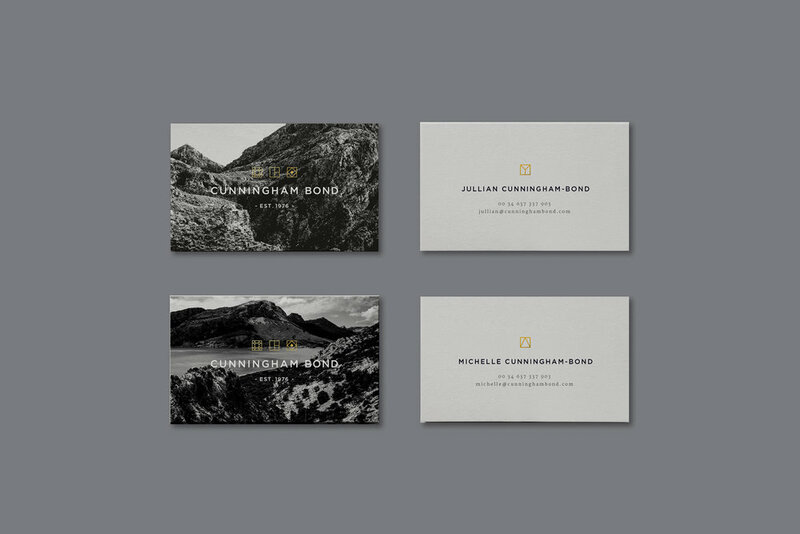 The brand collateral and stationary follows the 'black book' inspired monochrome photos and combines this with gold foiling.